Eating well before a flight has a direct effect on how you will feel during your journey, and making the decision to have a light natural meal made with fresh ingredients prior to boarding may considerably enhance your travel experience. Aside from that, we must not forget the array of healthy lifestyles that are on the rise nowadays, prompting business travellers, world backpackers and digital nomads to look for specific dietary options while they transit through airport terminals. In view of that, we want to enable our readers to find the best gluten-free, vegetarian and vegan food in Heathrow airport when they visit London. See our recommendations below, sorted by terminal. Located in the boarding area after security of “The Queen’s Terminal” (T2), Wondertree offers a selection of menus that are either vegetarian, gluten-free or both. Egg and chicken dishes, salads, English Breakfast, Mexican Breakfast, fruit bowls and sundaes are just some examples. But the best thing about this place is that it is not only healthy but also provides express service and pre-ordering through the airport’s app, which can be downloaded from the Apple App Store and from Google Play. This way, you can make sure you will get your gluten-free food in Heathrow without running the risk of missing your flight. It opens at 5 a.m. every day and closes after the last plane has taken off from this terminal. 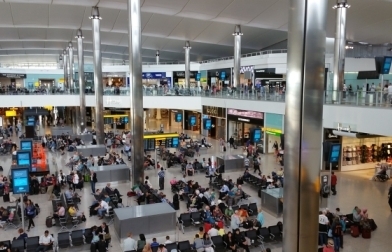 Also in Terminal 2, Leon is a popular spot where you can eat porridge for breakfast in Heathrow, a superfood salad for lunch and a variety of vegetarian options while in transit. Although you will need to wait until you have cleared security to enjoy the freshly made dishes included in the menu, this vegetarian restaurant in Heathrow remains open to passengers from 5 a.m. and for as long as planes are being boarded. Travellers who are well-acquainted with the city or even those who have visited London at least once surely know Pret a Manger. If you are looking for high-quality vegan food in Heathrow airport, we strongly recommend their soups, salads, sandwiches, wraps and bowls accompanied by a warming cup of organic coffee or tea. The natural, raw ingredients employed make them surprisingly light and so calorie-counting while on the go could not be easier. Should you need it, ask for an in-flight picnic package to take away. This restaurant is in the public area before security of terminal 3 in LHR, although you will find outlets after the screening control in the same building, at terminal 4 and at terminal 5 as well. Its working hours go from 6 a.m. to 10 p.m. daily. As the name itself indicates, aside from the fact that this place will satisfy your cravings if you are in the mood for a little luxury, it must be said that it is famous for its breakfast consisting of scrambled eggs, Scottish smoked salmon and avocado, undoubtedly one of the finest non-processed meals you can have in the entire facilities of the airport. It is situated after the security screening in terminal 4, offers express service and opens at 6 a.m. every day of the week. Whether you have time to sit at a table or you want to place a take-away order and eat on the plane, Wagamama has Japanese rice and noodles, granola, porridge, freshly squeezed vegan juices –like the carrot one or the super green juice- wok-fried vegetables, dumplings, miso soup and vegetarian desserts such as the coconut reika ice cream or the chocolate layer cake. They aim to serve your freshly made food within 15 minutes after you order in the boarding area of terminal 5, and their working hours go from 5:30 until the last departure of the day. Could you find your ideal gluten-free, vegetarian or vegan restaurant in Heathrow? If you plan to travel out of London by train, we recommend you also take a look at these places to eat in St Pancras International railway station.